Home » economy , newspaper » "I? I am a monument, to all your sins." "I? I am a monument, to all your sins." 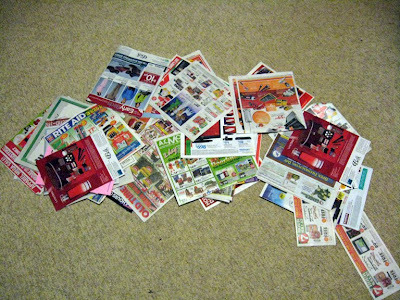 EIGHT HUNDRED AND TWENTY-SIX PAGES OF ADVERTISING CIRCULARS in today's newspaper. That's the pic of all of 'em in a heap on the living room floor. Anyhoo, every day of the year, Bridget did her job well. Except for Thanksgivings. The newspaper on those days was so bulky she couldn't wrap her jaws around it at all, to say nothing of holding it up so proud-like. The poor girl had to drag the paper across the driveway and into the house. And even then she struggled to bring it up the stairs. I'm not sorry for saying this, but if a newspaper is too heavy for a cocker spaniel to faithfully bring into the house because of all the advertisements in it, then it's got too damn many advertisements, period. AMEN!!! I wish there was a way to opt-out of all those circulars. I cringe when I think of all those dead trees!